Since December 2012, MSF has been providing free health care to homeless people, including migrants, that are sleeping rough on the streets of Milan, northern Italy. The primary objective is to provide a continuation of care to homeless people who are discharged from hospital, but who lack the possibility to receive home-based care. “The doctor told me to go to the sanatorium. I had to stay in there for a while, take medicines and keep warm” says Gheorghe, a 50-year old Romanian living in Italy since 1996. He is receiving treatment from MSF for a respiratory tract infection that he has developed from sleeping in rough conditions in the cold winter weather. After seventeen years of work I ended up on the street, like a dog. I cannot stand it anymore” he continues. Official data state that there are more than 47,000 homeless people in Italy, with more than 13,000 of them living on the streets of Milan. People sleeping rough are three to six times more likely to become ill than people that are housed. Many of MSF’s patients are suffering from chronic diseases like diabetes and hypertension, as well as conditions exacerbated by the cold weather during the winter months, such as bronchitis and other respiratory tract infections. In addition, the project receives a small number of trauma cases. “Homeless people who are hospitalised often end up falling ill again soon after they have been discharged.” says Gianfranco De Maio, MSF’s Field Coordinator. MSF provides free in-patient and out-patient care, including doctor’s consultations and round-the-clock nursing care. MSF has 23 beds inside a 150-bed structure which is run in cooperation with other local organisations. Since the project started, MSF has performed 975 out-patient consultations and treated 107 in-patients. Homeless people often face many barriers to accessing healthcare, such as lack of knowledge of where to go for treatment, lack of access to transportation, and lack of identification. Embarrassment, nervousness about filling out the forms and answering questions properly, and self-consciousness about appearance and hygiene when living on the streets also prevents homeless people from seeking care. Around 70% of patients seeking care from MSF are migrants from over 30 different countries, mostly in Africa and Eastern Europe. The remaining 30% are Italian citizens. The assistance is implemented as part of a larger initiative together with other medical and social organisations. MSF works closely with local hospitals and operates solely through private funding. 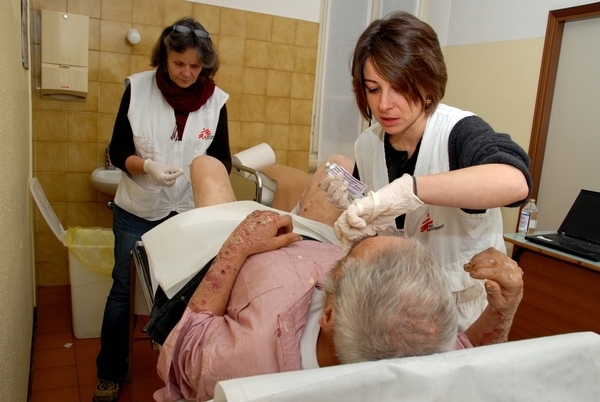 This is the first ever MSF project to assist homeless people in Italy. Activities will continue until end of March, when the coldest winter season has ended. MSF will use this experience as a starting point for further assessments of how a continuation of care for homeless people in Italy can reduce the need for re-visiting hospital emergency services.